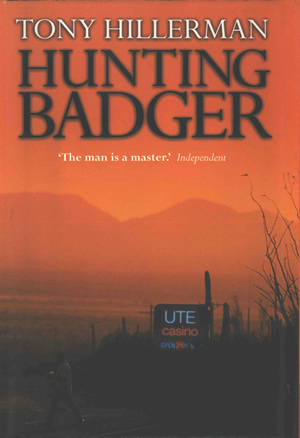 This is the British first edition of Hunting Badger, which is the fourteenth Tony Hillerman Navajo Mystery novel featuring Joe Leaphorn and Jim Chee of the Navajo Tribal Police. This edition was published in 2000 by HarperCollins in London. This is a hardcover book with dust cover. The dust cover features a wraparound photograph by Tim Bieber/Image Bank. The dominant colors in the photograph are orange-red and black. On the front cover, a man is crossing a road in the foreground, walking away from a neon sign for the Ute Casino. The background is a Sonoran desert landscape with saguaro cactus and low trees receding to a line of mountains in the distance. The book title and author name are printed over the photograph above the mountain skyline. On the back cover, the man's destination is a large refrigerated panel truck with headlights on, at the opposite side of the road. Behind the truck are several tall saguaro cactus, with the ridge of mountains again visible in the distance. Praise from the New Yorker and the New York Times is printed in white at the top of the photograph. On the spine, the author's name, book title, and publisher's imprint are printed in white. Binding: Black cloth-covered boards. The book title, author name, and publisher imprint lettered on the spine in gold.